Thailand is a unique country very rich in its tropical flora. In fact there are over 27 thousand different types in the country! Here we select a few species for you. 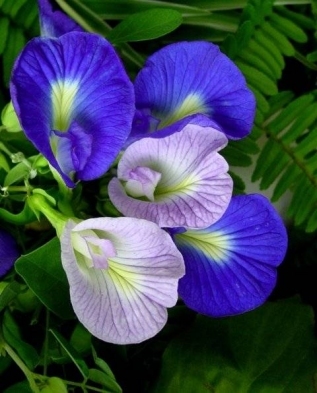 Clitoria ternatea is a vigorous, twining vine that blooms in just 6 weeks from seed. A Sensational plant for hanging baskets or trellis. These will bloom all year long in frost free zones. Bright, deep blue flowers to 2" year round. White blooms may also appear occasionally and paler blues. Likes Full sun to part shade, morning sun is best. Annual or tender perennial. 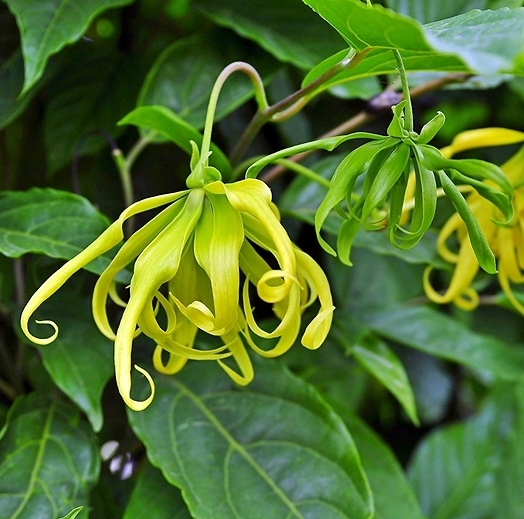 Ylang-ylang (Cananga odorata) is a tropical tree that produces star-shaped, spidery flowers that have a very heady floral fragrance. Takes a while to germinate, up to 6 to 8 weeks, the seeds from Ylang Ylang in Thailand are larger than some other varieties from different contries, as this is their true habitat. Heliconias are a tropical beauty that you can grow for their beautiful foliage and exotic flowers. They are members of the banana family, the many varieties of heliconia are native to tropical regions such as Central America. They do well indoors in cooler climates if you grow them in large pots. And if you live in a more southern climate, they are a stunning addition to your outdoor landscaping. They can be readily raised from seed. The seed requires soaking for two or three days and sown in well drained damp compost at a temperature of 30°C. 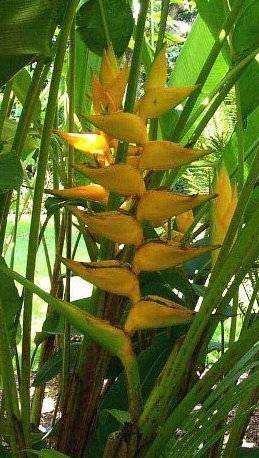 When choosing the soil for your Heliconia flower you must use well draining soil. Do not use potting soil or soil from the backyard unless it has been prepared correctly. If you add a mixture of 80% soil, and 20% coarse sand you will get what you need. Regular soil will hold too much water and rot out the root system. Water your Heliconia flower sparingly. After the first time you water it, do not water your Heliconia flower again until the soil on top of the pot is completely dry to the touch. 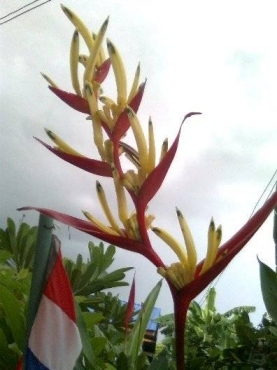 Your Heliconia flower will not survive if watered excessively. Heliconia flowers will grow strongly in bright warm light. They are an exotic flower so they thrive from warmth. The temperature should not reach below 23 deg. C.
Try to keep the humidity around 40%. Keep your Heliconia flower in bright sunlight all the way to 45% shade. A fabulous Red and Pink flower with yellow throat. This peculiar evergreen shrub is usually grown as an annual in most zones. Throughout the summer they produce numerous fluffy, ball shaped pale lilac pink flowers. 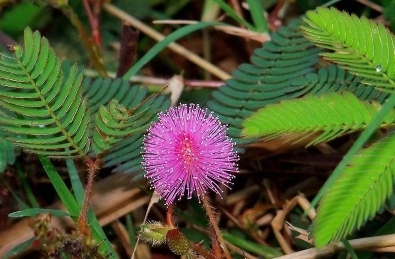 It is often grown for its curiosity value - the fern like leaves close up when touched and re-open within minutes, hence the common name Sensitive Plant. Easy to grow from seed, Sensitive Plants are adaptable to most soils in an open, sunny position and it even does well in poor soils. These also make great potted plants and are easily grown inside as year round houseplants in northern zones. Sow at any time indoors. The popular name of this large erect shrub is inspired by the clusters of bright orange-yellow berries that follow the flowers, in such quantities that they often cause the slender branches to droop gracefully. The lavender-blue or white flowers appear in loose clusters, and both berries and blossoms are often seen on a plant. Flowers have a mild sweet vanilla-like smell. There is also a form with variegated leaves, as well as one with bright yellow leaves; these do not bloom so profusely and are usually grown primarily for their foliage. 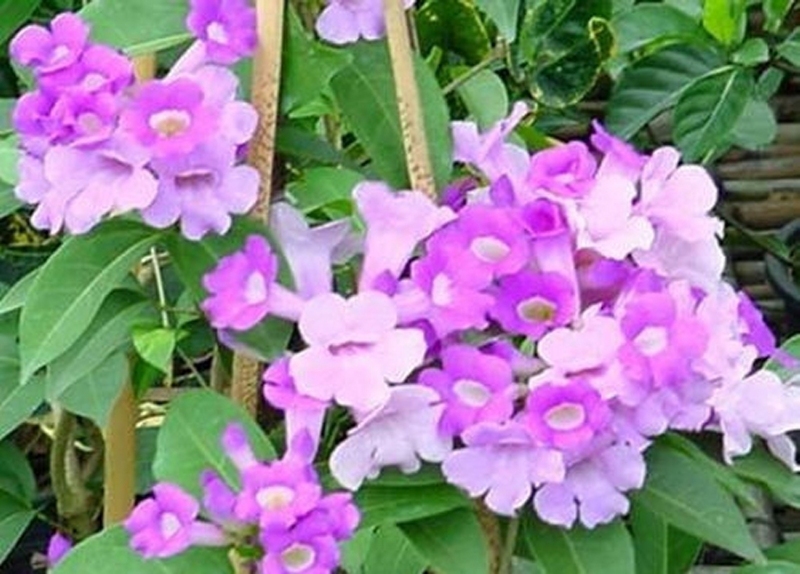 Duranta requires frequent pruning to make a bushy plant, especially when used as a hedge, and needs full sun to bloom well. Bringing the potted garden a unique burst of color and form, this amazing cultivar surpasses the standard lavender cultivar in brightness and intensity. Use as a basket plant, a mounding bush or train into a standard, this plant will give the color deep purple new meaning. As free flower as any Duranta it covers itself in dripping chains of bloom. Each petal in the flower is defined by a light lavender boarder and marked by a white eye. A stunning sun lover that will bring months of gorgeous color to any garden, sunroom or conservatory. 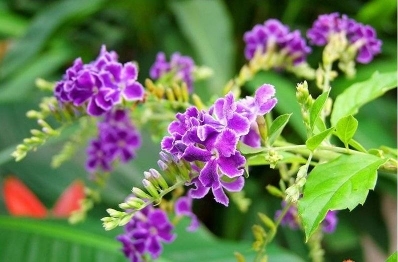 Duranta is easy to grow and requires little care. It tends to sprawl and will need regular thinning and pruning to keep it under control. Light: Does best in full sun. Tolerates partial shade. Moisture: Needs regular watering. Duranta is only moderately drought tolerant. WARNING :The attractive fruits are poisonous to humans. Do not use this shrub in childrens' play areas. The Minnie root is a common plant in the garden and along waysides. It keeps close to the ground although the stems may grow rather long. The stems are covered with very fine hairs while the leaves are elliptical and light green. The flowers are pretty funnel-shaped and blue to violet in colour with some white at the base. The plant forms longish, thin seedpods which, if they are being moistened, by a shower for example, explode with an audible crack. Medicinal : In Suriname’s traditional medicine it is used as an anthelmentic, against joint pains and strained muscles; bladder diseases. Also used as a abortifacient, The root is used against kidney diseases and for whooping cough. An infusion for cleansing the blood. "Garlic Mamosa Thai vine flower"
A medium growth, dense evergreen vine with deep lavender flowers and a white throat fading to a paler lavender. The plant will bloom heavily in the Spring and Fall. Will have some flowers on and off throughout the year. It is one of the most rewarding flowering vines that you can grow, unless that you are a vampire! Strangely enough it smells like garlic. However, it doesn't smell if the plant is left alone, only when the leaves are crushed. Flowering twice a year you will find it quite often covered with flowers. Flowers start off purple and change to a lighter shade of lavender with age. Eventually fading to almost white. You will see 3 different colour of flowers at the same time on the plant. Great for chain link fences (or any fence), or a large trellis. This vine has a strong garlic odour, and is even used as substitute for garlic in food. The entire plant - roots, vine and leaves, are useful. It is used to reduce fevers, treat colds, throat, and respiratory ailments. The plant is said to help get rid of bad luck and is a favourite with hunters. 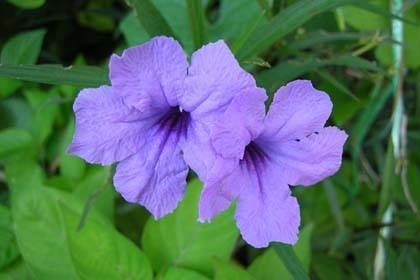 It can be grown in containers and should be trimmed after the flowers are gone. Grow in well-drained soil-less potting mix. Full sun to half-shade. Avoid freezing temperatures. Keep compost moist, but do not over water. Mist leaves every day. Reduce watering in winter.